CEO 的話: Merry Christmas and a Happy New Year! In my Christmas message two years ago I reflected on how 2015 had been a disastrous year for FIFA and I looked forward to a time when it would have a new President and a reform programme. Last week the HKFA hosted a FIFA Summit which was Chaired by the FIFA President Mr Gianni Infantino. There were 15 Member Associations present and we were all consulted by FIFA on some of its future programmes and had an opportunity to question FIFA representatives on a range of topics. This refreshing and inclusive approach simply wouldn’t have happened under the old regime. The fact that this event went virtually unnoticed is also indicative that the ‘new’ FIFA is more interested in doing business than it is in boosting egos through self-promotion. The HKFA is already receiving more than five times as much funding from FIFA than two years ago. There has been a swift and remarkable change at FIFA and I congratulate them for it and wish them a Merry Christmas! As ever 2017 has been an eventful year. As you can see from the picture the long-awaited and much-needed Hong Kong Jockey Club HKFA Football Training Centre is nearing completion. It’s going to be delivered a bit later than we expected due to some adverse weather and technical challenges but it will be worth waiting for, I can assure you of that. This is one of the final recommendations of the original Project Phoenix to fall into place and I can’t help feeling somewhat emotional when I walk around the site and see what has been finally achieved. With a lot of hard work visions can become reality. Another highlight was the Premier League Asia Trophy which took place in July. The weather tried to spoil it like it had in 2013 but not this time. The new pitch at the HK Stadium performed beautifully and two full-house crowds were thrilled by some of the world’s best players. I will never forget the sea of red and the passionate rendition of You’ll Never Walk Alone. Another very emotional moment to savour for me as a Liverpool fan. 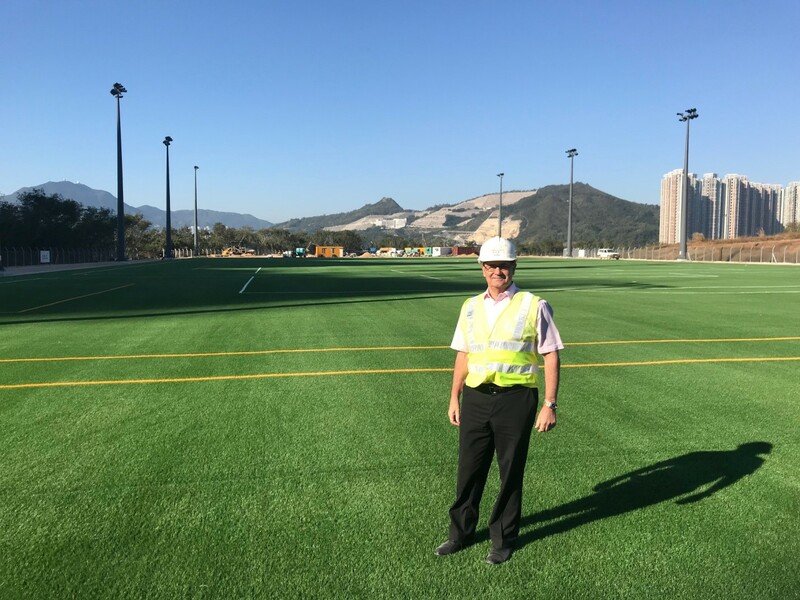 2018 will see the operational phase of the Football Training Centre, Hong Kong teams participating in the AFC Champions League (good luck to them), the culmination of the Asian Cup qualifiers and the World Cup, to name just a few. It’s going to be another busy and exciting year. Once again, thanks to everyone for their support. Merry Christmas and a Happy New Year!